Definitive rules for circumnavigations of the world completed by human power have been published by AdventureStats of Explorers Web Inc., an independent group of international historians, geographers and explorers, whose conclusions help clarify the recent dispute between the three teams pursuing human powered circumnavigation attempts or claims: Expedition 360 (Britain), Expedition Canada (Canada) and Around 'n Over (Turkey/US). It looks like the verdict is now out. You may remember the row that erupted in the international press earlier this year between myself, Canadian Colin Angus and Turk/US resident Erden Eruc over the definition of a legitimate human powered circumnavigation (HPC). Colin, who is claiming to have completed an HPC in May 2006, traveled exclusively in the Northern Hemisphere, which to Erden and I is not enough to constitute a circumnavigation of the world. Several exchanges in the press followed before the controversy simmered down again. "To...Colin we would suggest the term 'around the Northern Hemisphere'". More on Explorers Web Inc. Meanwhile another circumnavigator, Adrian Flanagan, has chosen to employ the antipodal criteria in his attempt to sail the first-ever single-handed “vertical” circumnavigation of the globe - considered the last great sailing prize in long distance, single-handed sailing. Following the precedents set by earlier pioneering yachtsmen and women who have completed west-to-east and east-to-west circumnavigations, the vertical route has remained elusive because of dangers of ice in the High Arctic Region. Recent changes in global weather and temperature patterns have caused Arctic ice floes to break up earlier. The ice edge is receding further clearing the route for a short period during summer. 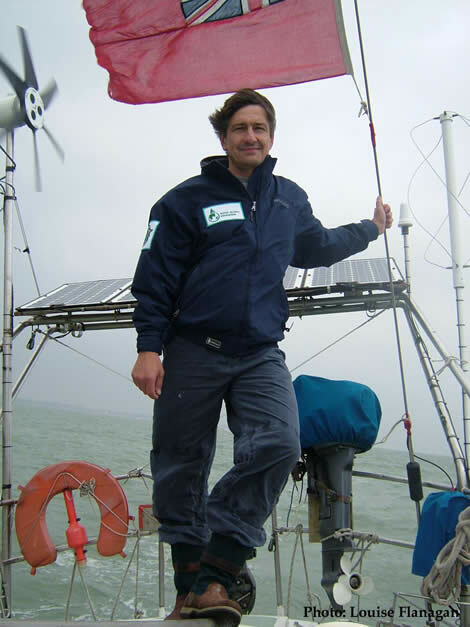 Flanagan, 46, set sail on the Alpha Global Expedition on October 28, 2005, and covered 26,000 miles going west around Cape Horn to Nome, Alaska, where his 40-ft. stainless steel sloop, Barrabas, has spent the Arctic winter. 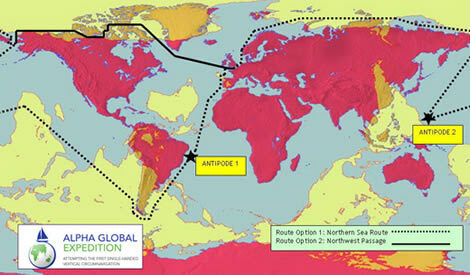 Flanagan's route will take him along Russia's Northern Sea Route. Success will see Barrabas become the first British flagged yacht to sail Russia's Arctic coast and Flanagan, the first sailor to achieve this feat single-handed. To pull this project off, Flanagan's track will pass over two points on the earth's surface which are diametrically opposite each other - or antipodal. History's first passing through antipodal points was completed in 1522 by 18 members of Ferdinand Magellan's expedition to find a route to the Spice Islands by sailing west. His expedition criteria ensures that the equator is crossed at least twice and the distance traveled is about 22,600 nautical miles or more, or about the circumference of the globe.